Neuromuscular Stimulator - Neurostim(Home) Uses of electrical stimulation in medical applications are many and they are being used extensively in the developed countries for many years. The combined use of NST and EMS enhances the benefit for the patients. Neurostim is a non invasive medical device used for increasing local blood circulation, reduce pain, Stiffness and muscle spasm around the area of application. The unit is supplied with different applicators such as conductive electrode(2” x 2” size), Conductive Socks, Conductive Gloves and Conductive Slipper. As the Neurostim sends these restorative signals, the brain senses them and responds by releasing endorphins, internally generated pain relievers (with no side effects) and these endorphins travel throughout the body via the bloodstream reducing pain all over the body, relieving anxiety, and releasing tension so you can enjoy a full night's sleep without the need for sleep aids. • Relieves Your Pain and Numbness • Helps You Sleep All Night • Restores Your Balance and Mobility • Restores Feeling in Feet and Hands We have introduced the Hospital model about 3 years back and it is a big success for treating the pain due to diabetic neuropathy, burning sensation, tingling sense. Due to the increased demand for patient model we are not introducing this patient model. IR LED Light Therapy - Neurolite. Use of RED LED and Infra-red LED (IR) in medical applications are many and they are in use for many years in the developed countries. The combined use of LED and IR enhances the benefit for the patients. "Neurolite" is an non-invasive medical device used for increasing local blood circulation, reduce pain, Stiffness and muscle spasm around the area of application. The flexible treatment pad consists of an array of Infrared LED of wavelength 880nm and visible RED LED of wavelength 650nm. We have 3 different variants namely "Neurolite-Prof", "Neurolite- Hosp" and :Neurolite-Home". NEUROLITE is the Regd. Trade Mark of Diabetik Foot Care India Pvt Ltd. Many people have found that LED therapy can provide a complete and lasting resolution of many problems when it is coupled with medical diagnosis. Most existing scientific studies deal with Low Level Laser Therapy (LLLT). Essentially these studies show light therapy may reduce pain after dental extractions, improve immune functions, decrease wound healing time, increase the speed for healing of fractures, relieve the discomfort of eczema, increase mitochondrial ATP production, improve the cosmetic appearance of stretch marks, heal pressure ulcers, increase production of DNA and collagen, and increase the activity of fibroblasts. Similar studies are beginning to appear in which LEDs were used with parallel results. The Neurolite system uses non-coherent light. LEDs produce a larger light dispersion beam than lasers and allow a greater margin of error in their effectiveness at reaching the targeted area. Lasers can be very dangerous when not used properly or by properly trained people. LED therapy is completely safe to use. In fact the FDA has relaxed most restrictions on human LED infrared therapy. What can the Neurolite do? • Helps pain relief. • Helps increase blood supply to the affected area. • Helps to reduce swelling. • Helps to stimulate the immune system. • Helps to stimulate nerve conduction. • Helps develop collagen and muscle tissue • Helps generate new cells and tissue repair. • Can be used in conjunction with conventional and alternative therapy. • Helps increase speed, quality and strength of cell tissue repair. • Helps to promote faster wound healing. NEUROLITE - Home: Hand held device supplied with one pad with provision for one more additional pad. NEUROLITE - Hospital: Table top device with two regular flexible pads with timer setting. NEUROLITE - Professional: Table top device supplied with two regular flexible pads and two foot long flexible pads. We would like to introduce ourselves as an ISO 13485:2012 certified manufacturer and distributor of Medical Devices for the management of Diabetes and its Complications in India. We would like to thank you for your continued patronage for 24 long years! We wish to share with you that we have done more than 5900 installations in about 34 countries. We have our international Distributors working in Australia, China, Denmark, Malaysia, Nigeria, Oman and Spain. Our Customers in India are supported by 25 Customer Care Engineers across the country. We have products for the diagnosis of vascular, neuropathy complications, podiatry, wound care and Therapy applications. Our product portfolio as follows: ABI VASCULAR DOPPLER HAND DOPPLER - LIFEDOP - LI50 R Hand held Vascular Doppler with 8 MHz unidirectional probe is used to detecting the Arterial and Venous insufficiency. Ideal handy tool for measuring the point of care ABI. Operates with rechargeable batteries. Imported from Summit Doppler Inc, USA. ABI / TBI Vascular Doppler PC based - VERSALAB LE/Dx The Versalab LE/ Dx is a semi automated device that is used for the measurement of ABI / TBI. This machine call also be used for detecting the arterial and venous insufficiency. Supplied with 8 MHz unidirectional probe, PPG Toe Sensor, Toe BP cuff, Ankle and Brachial BP cuffs. Penile Brachial Index may also be done with this model. Thermal array Printer is also supplied with VERSALAB Dx. Both models have computer connectivity and the supplied software connects the Versalab Doppler with your computer for data transfer, data storage and patient report printing. Automated ABI / TBI Vascular Doppler PC based - VERSALAB Auto The Versalab Auto is a fully automated device that is used for the measurement of ABI / TBI. This machine call also be used for detecting the arterial and venous insufficiency. Supplied with 8 MHz unidirectional probe, PPG Toe Sensor, Toe BP cuff, Ankle and Brachial BP cuffs. Penile Brachial Index may also be done with this model. Fully automatic and captures the waveform and the systolic BP of all the limbs for measuring ABI / TBI. Have computer connectivity and the supplied software connects the Versalab Doppler with your computer for data transfer, data storage and patient report printing Transcutaneous Oxygen Monitor (TCOM) – PERIFLUX 5000/6000 Transcutaneous Oxygen Monitoring is an useful tool to determine the wound healing assessment, hyperbaric medicine, amputation Level determinations etc. This unit can be further expanded to include the other techniques to diagnose ABI / TBI, Skin Perfusion Pressure, Pulse Volume Recorder. Fully automated to capture the Doppler waveform, inflate and Deflate automatically, connected to computer for data storage and patient report generation. Imported from M/s. Perimed Instruments, Sweden. NEUROPATHY PRODUCTS Medical Monofilaments 5.07/10gm – MF10GM The reason for the ulceration in diabetes is commonly due to the loss of protective sensation. Current research promotes early detection of neuropathy In an effort to standardize and simplify the detection of insensate foot, the 5.07/10gm Monofilament is recommended by the IDF and WHO as a device that can be used by health professional at every level of care. Portable Vibration Sense Device – VIBRATIP Vibratip is a pocket sized device for testing the loss of vibration sense. This Vibratip vibrates around 125Hz and produce fixed vibration equivalent to that of a Biothesiometer value of 25 Volts. Useful handy tool to quantify the loss of vibration perception threshold. Digital Step Biothesiometer - VIBROSCREEN The stepped Vibroscreen designed for using during a large diabetic screening camps. This is also called an electronic tuning fork whose vibration intensity may be varied step by step output voltage of 15V, 20V, 25V and 50V. Digital Biothesiometer - VIBROTEST Vibrotest is an useful non-invasive tool for the detection of subclinical neuropathy. The vibration output of this unit is varied between 0 and 50 Volts linearly. This electronic tuning fork similar is useful for grading the loss of vibration perception threshold of the diabetic neuropathic foot and also be used to quantify the erectile dysfunction. Computer connectivity is not available with this model. Digital Biothesiometer - VIBROMETER VPT VIBROMETER- VPT is the largest exported model from India and is working in about 34 countries. This is a complete model also having computer connectivity. This model can be connected to any computer/laptop using the USB cable and the supplied software helps to store the data in the PC and also helps to generate 4 different patient reports. This model has all the other functions of the VIBROTEST model. Neuropathy Analyser - VIBROTHERM Dx In diabetes polyneuropathy is an important complication and should be diagnosed as early as possible in order to prevent damage to the patient. This unit helps to detect the small and large fibre neuropathy using the loss of vibration perception threshold and thermal (HOT/COL) perception thresholds. Full solid state design, PC enabled, Non invasive testing of pain thresholds, Digital 0 to 50 Volts output indicator for vibration perception threshold, 1˚C to 50˚C for Hot & Cold perception threshold. 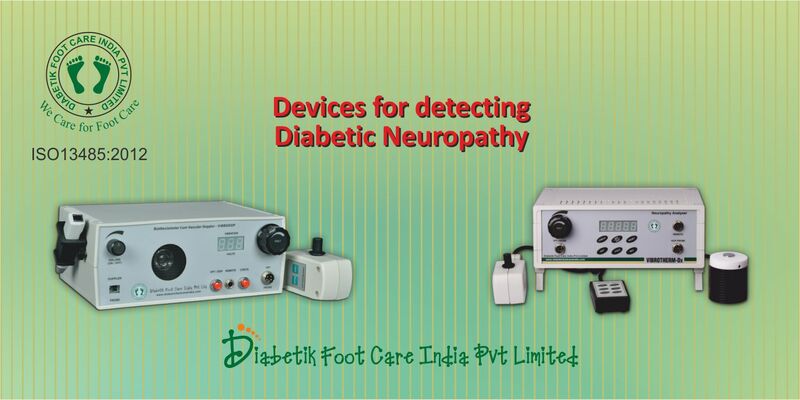 Cardiac Autonomic Neuropathy System Analyser - CANS-504 The most over looked of all serious complications of diabetes in CAN, which encompasses damage to the autonomic nerve fibres that innervate the heart and bllod vessels, resulting in heart rate control and vascular dynamics. CANS 504 uses cardio-tachogram for R-R interval and NIBP module for measuring both Sympathetic and Parasympathetic autonomic nervous system response of the patient. Only a battery of 6 tests measures the data and the software determines the measurements. Fully computer based and the produce the reliable reports. FOOT CARE PRODUCTS Foot Imprinter / Harris Mat – FM1111 The original diagnostic method for foot evaluation. Foot Imprinter Harris Mat is widely used to take the imprints of foot to analysis the plantar pressure variations of the foot. Simple, yet effective method that produces reproducible results when used properly. The complete set include the imprint mat, prescription paper, inkpad and rubber roller. Simple Plantar Pressure System - PODIASCAN The Podiascan system provides an economical and efficient method to measure static and dynamic plantar foot pressure distribution. The Podiascan system produces instantaneous and permanent high resolution image of the pressure distribution across the plantar surface. The unit consists of Harris Mat, Scanner Copier and Printer, Image Analysis Software and Patient Reporting Software. Qualitative multicolor output makes the pressure reading easier, used to identify areas of potential ulceration, Pre & Post surgical evaluation, Degree of pronation or supination. Plantar Pressure Pedography - emed The Plantar Pressure measurement system model emed is used to find the pressure points in the foot .It is an electronic mat imported from Germany. Generates Maximum Pressure Point (MPP) report, 2D & 3D pictures of pressure point. Displays Foot roll over frame by frame. Prints A4 size Print screen copy or 1:1 foot size. We represent M/s. Novel GMBH, Germany in India for their emed and pedar range of products. Electric Pedicure File System - PEDINOVA The Electric File System model Pedinova is a powerful, high performance electric file machine. This is a professional tool used for trimming and shaping toe nails, smooth rough skin like corn and calluses, removing cracks on the skin, smoothening broken nails etc., Non Contact IR Digital Thermometer Inflammation is one of the earliest signs of tissue injury and ulceration. Skin temperatures could be used as a surrogate measure of injury and localized inflammation. The aim of this product is to help high-risk individuals identify areas on their feet that are inflamed and prone to ulceration before a wound develops. Simple tool one handed operation, Laser targeting, LCD with back light, Wide temperature range, ˚C /˚F select switch. THERAPEUTIC PRODUCTS Neuromuscular stimulator - Neurostim Neurostim is a drug free, painless answer to eliminating pain and burning. The Neurostim works by stimulating all your nerves from your lower back down to your toes with a specific gentle waveform that your peripheral nerves naturally use to communicate with the rest of your body. Neurostim Relieves your pain and numbness, helps you sleep all night, restores your balance and mobility, restores feeling in feet and hands and reduces or eliminates pain medications. IR LED Light Therapy - Neurolite Neurolite Therapy is a medical device that emits infrared light at a wavelength of 890 nm along with visible LED light at a wavelength of 660nm, and can be applied to any area of the body, which may provide a relief for the patients. Positive results are expected after 6 treatments of 30-40 minutes duration. There are different size pads cater to different applications. Neurolite Therapy device helps the patient if they can use early on to relieve pain, increase microcirculation, promote healing and relieve muscle spasm, it is possible to decrease pain levels, decrease the number of falls, the number of injuries and the necessity for amputations. It is also possible to increase the patient’s level of activities and quality of life, (due to reduction in pain) as well as overall patient compliance and satisfaction. Electronic Pain Killer – TENS Electronic Pain Killer T.E.N.S. (Transcutaneous Electrical Nerve Stimulation) is a unique pain management tool that also works as a muscle relaxant. The therapy is uses mild electrical impulses for pain management instead of conventional drugs. It is well established as a safe and reliable pain management system which has been used for decades in USA. TENS Therapy gently stimulates nerves and blocks pain signals before they can be received by the brain. TENS Therapy is generally used to relieve back pain, but many types and causes of pain may benefit from it, including arthritis. Many scientific literature and researches indicate that electronic pain reliever T.E.N.S. is an effective pain relieving therapy for diabetic and other painful neuropathies. WOUND CARE AND PODIATRY PRODUCTS Ultrasound Wound Debrider – UWI – II The Ultrasound Wound Debrider Therapy System, that applies low-frequency, cavitational ultrasound to gently remove dead and diseased tissue cells, kill harmful bacteria and Biofilm, and leave healthy and pre-healing granulation tissue intact. The successful removal of necrotic materials and devitalized tissue from a wound is an essential first step towards wound healing. This system offers an extremely thorough debridement, with minimal pain sensation and excellent preservation of healthy, soft tissue. The built in, adjustable irrigation system allows cell debris, bacteria, and exudates to be easily flushed from the wound site, an important element in wound cleansing. Podiatry Chair 3 Motor / 5 Motor Series These Podiatry chairs were developed for a comfortable seated position for the client at all times. Its slender appearance makes the room or consultation area appear more spacious. In addition, the arms fold up completely, making it easy for the client to get in and out of the chair from the side. The leg supports of the chair are contoured and the height and length can be adjusted individually. Their ergonomic shape provides stable support for the lower leg and foot. These chairs provide motorised adjustment of back rest, height and tilt using a hand remote control. An optional foot control provides hands-free working condition. PODIATRY KIT: This imported Podiatry instruments made of high quality steel which may be autoclaved. We have made them into two sets consisting of 5pcs and 10pcs. IR Thermal Imager – i3 Approximately 15% to 25% of patients with DM eventually develop foot ulcers. An Infrared non-contact thermal imager is considered a newer and effective way of determining these complications. Patients with diabetic neuropathy (defined as vibration perception threshold (VPT) values on biothesiometry greater than 25 V) had a higher foot temperature (32–35 °C) compared to patients without neuropathy (27–30 °C). Thermal imaging has been successfully used for medical diagnosis of vascular disorders. The temperature in the affected regions of patients with vascular disorders was low in the extremities due to obstructed arteries.